I think maybe he’s related to Kilroy too. @TheNate – well done, sir! VERY funny! 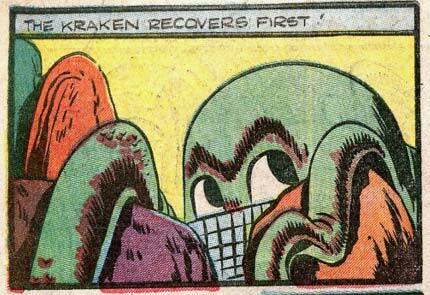 Behold, the Krakens TRUE face! @Tophat: Yah, that’s the one! Looks like a Herosquad version of Ozy’s critter in Watchmen. Only creepier. I think the Kraken is adorable. We may be killed, but we’ll all be making silly faces at the time &^). Sadly, after the bunt, second remained stolen.